In battle, the Shaltari are fearsome adversaries. Their swiftness is unmatched, their firepower spectacular, their bravery undeniable. The beauty of their vessels bellies their true nature; engines of death, honed to lethal perfection long before humanity learned to throw stones. They are peerless masters of technology. 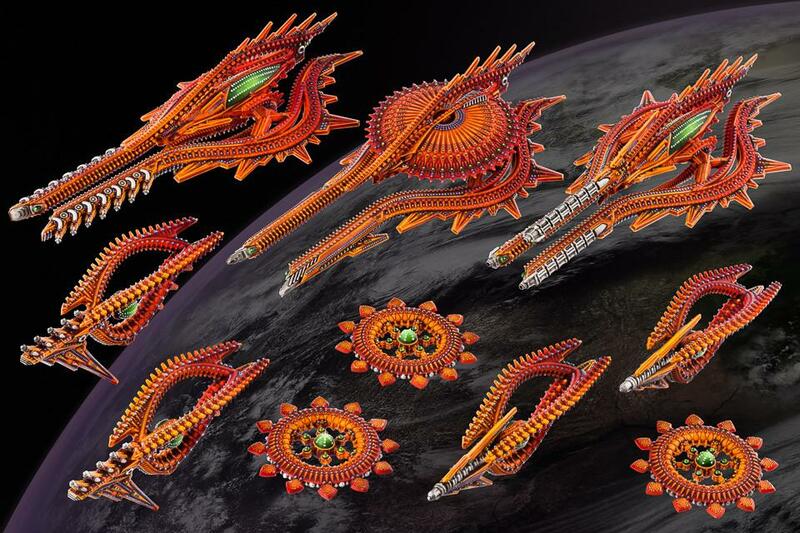 The Shaltari fleet is a finely balanced blade poised to cut to the heart of any foe. Their gunnery skills and scanners are unrivalled, delivering death from ranges other races can only dream of. The fantastically advanced energy shields can be raised at will, protecting their fragile but stealthy ships from harm at the expense of visibility. Skilful captaincy and timely execution are rewarded with sublime victory. This boxed set is the perfect way to get started with a Shaltari fleet or add to an existing one, since it can be configured to almost any requirement! 3x Shaltari Cruisers: These multi-part hard plastic lavishly detailed 1:9150 (0.2mm) scale miniatures can be assembled as up to ten different classes, including cruisers, heavy cruisers, fleet carriers, light cruisers and motherships! Typical length 109mm. 25 Parts per ship (including optional ones). 4x Shaltari Frigates: These multi-part hard plastic lavishly detailed 1:9150 (0.2mm) scale miniatures can be assembled as up to four different classes. Typical length 68mm. 20 Parts for all four ships (including optional ones). 3x Shaltari Voidgates: One of these lavishly detailed 1:9150 (0.2mm) scale single part hard plastic miniatures is included with each Shaltari cruiser. Radius 38mm. Shaltari Fastplay Sheet: Includes stats and battlegroup setup for the fleet build shown on the cover, making it easy to get gaming quickly! Also includes quick reference tables.